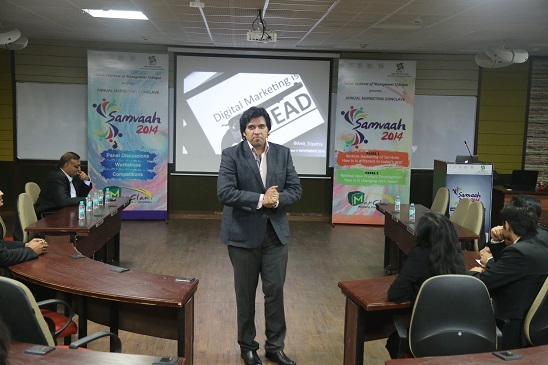 Samvaah– The first edition of the annual Marketing Conclave of IIM Udaipur was hosted on 15th November, 2014 at the institute. Samvaah is a student driven initiative that was conceived and organized by MarClan- the Marketing Club of IIMU. Samvaah, in sync with its name’s translation- “Marketplace” is an initiative to bring together marketing enthusiasts from academia, the local community and industry alike, to share insights and discuss the various developments in the field of marketing. 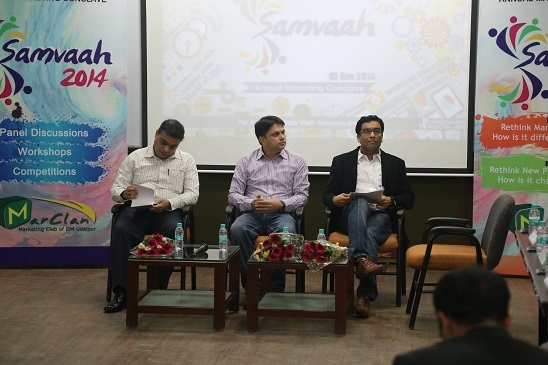 The umbrella theme for Samvaah 2014 was “Rethink: Changing Marketing Practices with Changing Times”. The run-up to the event saw numerous online and on-campus competitions being held, with teams from the best B-schools across the country competing in terms of creativity, talent and marketing potential. 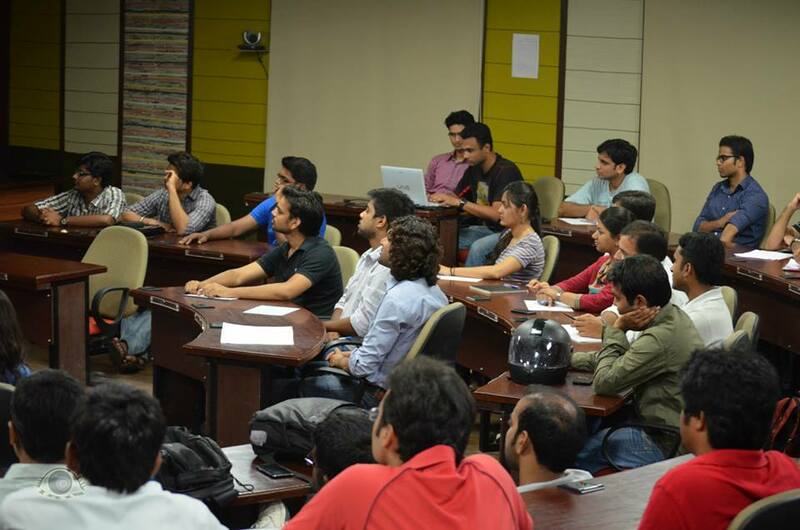 The event kicked off with a digital media workshop by Mr. Amit Tripathi- the CEO of Ideate Labs. The workshop began with a very intriguing statement: ‘Welcome to the funeral of digital media…’ and then went on to discuss how being digital has gone beyond just media channels like Facebook and twitter, to become all pervasive in other walks of life as well. Mr. Tripathi left the students with two important insights: that simplicity and finding common ground between the company and the consumer are the mantra to successful marketing. The Sales Workshop that followed had the speakers- Mr. Martand Shukla, ASM of Pepsico and Mr. Bharat Nagori, one of the largest distributors in Udaipur, emphasize that profitability and availability were the major requirements of a good sales campaign, while reiterating the importance of considering sentiment and market experience while designing a sales and distribution strategy. The next session included the finals of Juxtapose-a brand extension competition which saw students from IIM Indore (Mumbai Campus), SPJIMR and two teams from IIM Udaipur, do their best to impress the judges with the innovativeness and clarity of their ideas, with team WarClan of IIM Udaipur eventually winning the first prize. The judges also shared very unique insights on proper segmenting and positioning of the product, with the audience. 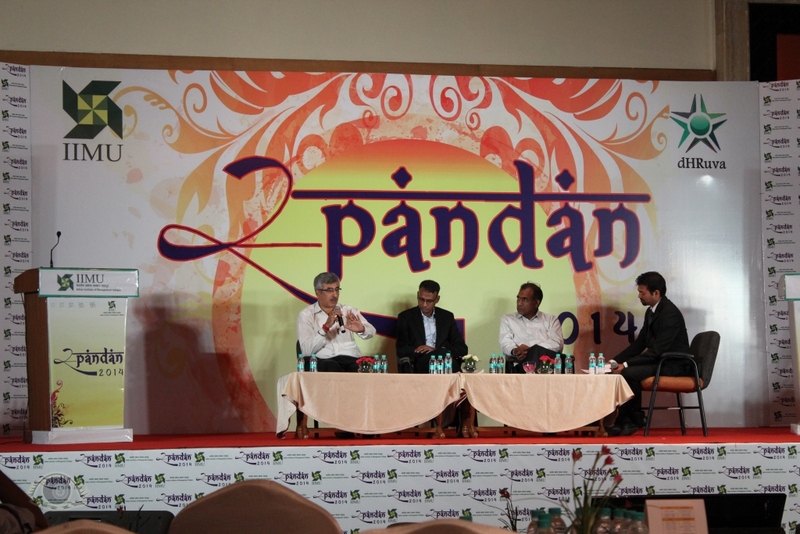 The post lunch session began with an address by Prof. Janat Shah-Director, IIM Udaipur. 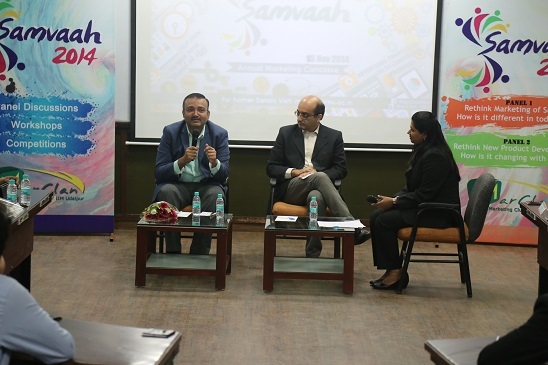 Prof. Shah laid emphasis on the three main focus areas of IIMU, namely research, transformation through the MBA program and integration with the local community, all of which were the driving factors behind the organization of Samvaah. Panel 1: Rethink Services Marketing- How is it different in today’s era? Panel 2: Rethink New Product Development-How is it changing with times? Mr. Abhishek Sinha- Co-founder and CEO, Eko India Financial Services Private Ltd. The event ended with a felicitation of the speakers and a vote of thanks. IIMU’s first marketing conclave was a resounding success with speakers and participants alike, appreciating the seamless organization of the entire event and the insights they gained through the discussions. 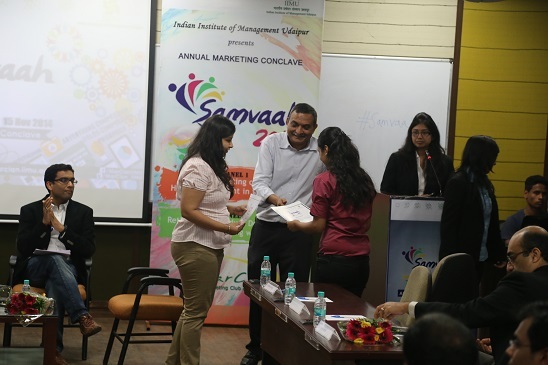 IIM Udaipur presents Samvaah 2014 – Annual Marketing Conclave! Indian Institute of Management Udaipur is going to host the first edition of its Annual Marketing Conclave, “Samvaah 2014“, on 15th November 2014 in IIMU Campus. Conceived and organized by MarClan – The Marketing Club of IIM Udaipur, Samvaah, in sync with its name translation – “Marketplace”, is a student driven initiative that aims to unite marketing enthusiasts from different B-Schools in a day long conclave. A precursor to the event has a series of on-line and on-campus competitions covering different verticals of Marketing. The competitions resonate to give different B-Schools participants a platform to showcase their talent, creativity and marketing potential and win exciting rewards. One other key feature of the summit is to invite industry leaders from the corporate world to the IIMU campus and share their insights with students through engagement in diverse panel discussions, lectures and workshops. MarClan strives to ensemble the marketing talent within the IIMU campus and different business schools for knowledge exchange and Samvaaha 2014 scheduled on 15th November 2014 in IIM Udaipur is largely centered on our umbrella theme, Rethink. Gear up for this space and keep checking our communications at the channels mentioned below for more information regarding competitions and discussions. 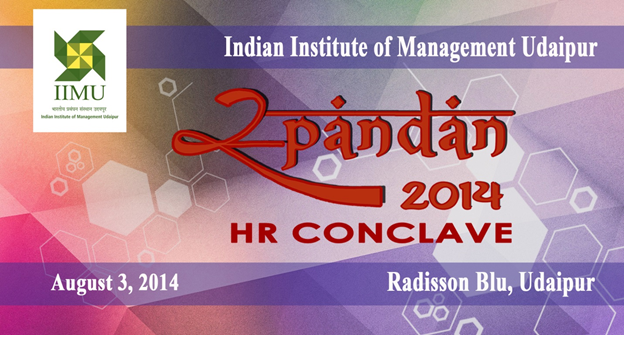 IIM Udaipur successfully hosted the second edition of its annual HR Conclave – Spandan 2014! 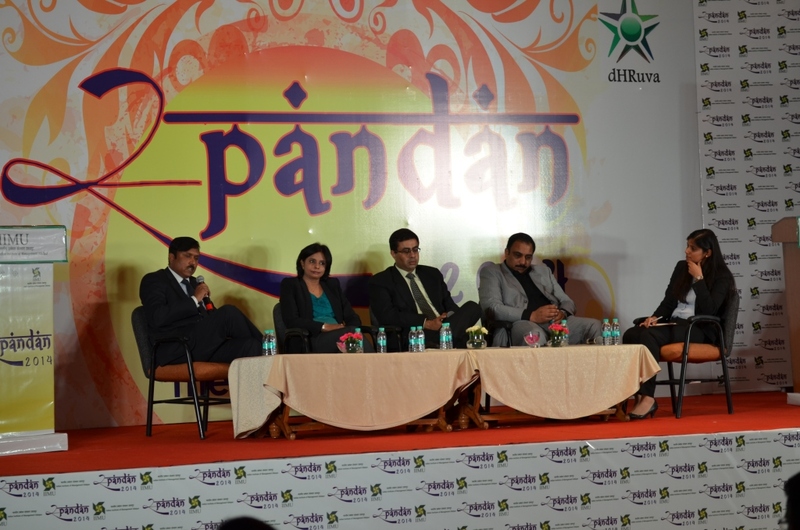 Indian Institute of Management, Udaipur successfully hosted the second edition of its annual HR Conclave – Spandan 2014 on 3rd August, 2014 at Hotel Radisson Blu, Udaipur. 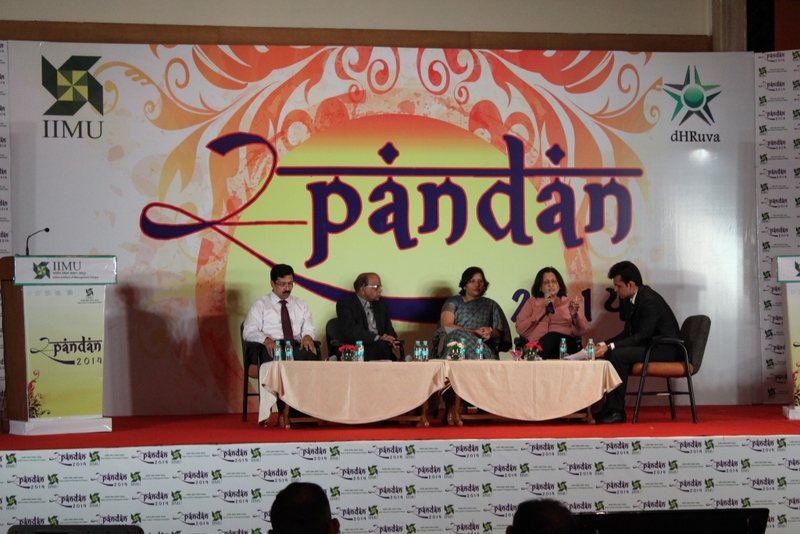 Carrying forward the legacy from the last year’s inception of Spandan, this year’s conclave was conceptualized around the central umbrella theme, “Rethink: Changing HR practices with Changing Times”. 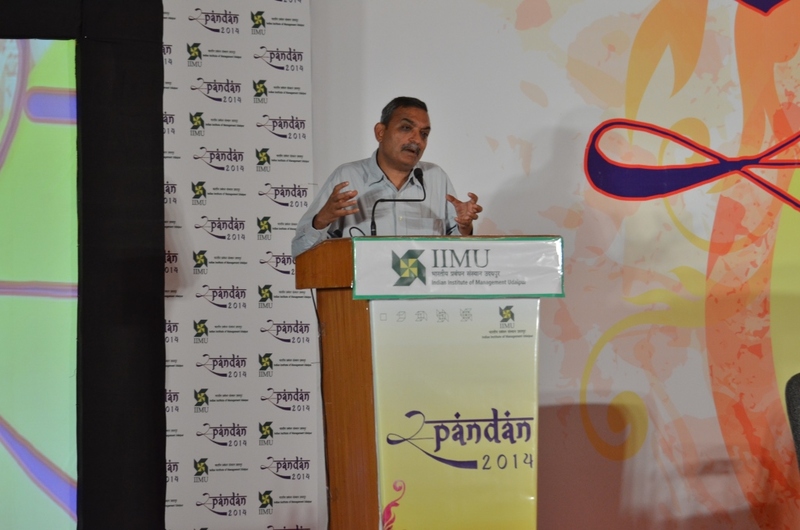 The event began with an opening address by Prof. Janat Shah – Director, IIM Udaipur. He spoke on the importance of collaboration of academia and industry on a common platform like Spandan for discussions critical for the reinvention of the HR Industry. Prof. Shah also laid stress on the IIMU’s strong focus on Research, Analytics, Immersion in the three forms of Rural, Corporate & Global Immersion and Entrepreneurship & Intrapreneurship in his speech. 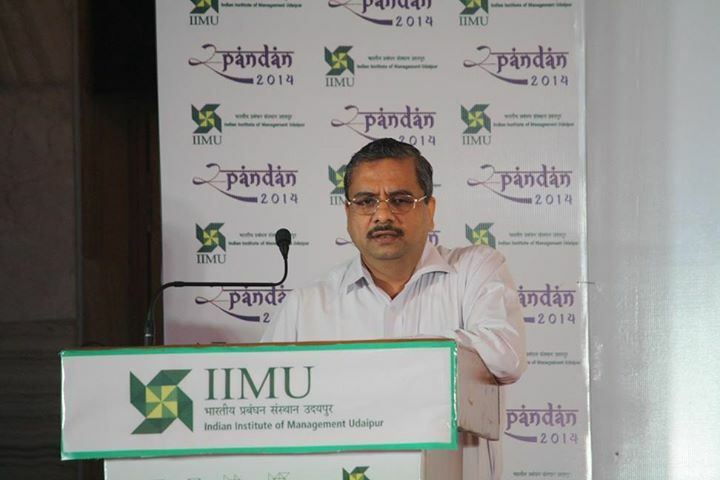 He also threw light on the student driven initiatives through different clubs and committees at IIMU citing the example of Spandan been organized entirely by dHRuva – The HR Club of IIM Udaipur. Prof. Sunil Maheshwari – Adjunct Faculty, IIM Ahmedabad and Ex-Advisor to the HRD Ministry, Govt. of India, served as the Keynote Speaker in the conclave. Prof. Maheshwari brought in his research statistics in his speech which showcased the changing trends in HR and the challenges posed to it in the current scenario. His mathematical study was based on a survey on leadership traits collected from a sample of MDP candidates who occupy top leadership positions in India and the persistent need-gap analysis in their skills. He concluded his speech with mentioning the importance of investment in faculty development and pedagogy modification with time in management schools. Rethink Approach: Are the present leadership programmes creating ‘leaders’ or ‘followers’? The participating corporate leaders in the discussions were Mr. Aashish Singh – VP Head HR, Sutherland Global, Ms. Padma Rajeswari Tata – Senior Dr. & Head, Dr. Reddy’s, Mr. Sugato Palit – Exec. Dir HR & Admin, Experion, Mr. Vinod Rai – Head Corp. HR, Maruti Suzuki, Mr. Ashwani Prashara – Head HR & IR, RIL, Mr. Prabhu Aggarwal – Chief Learning Officer, Jindal Steel, Mr. G. Ravishankar – President HR & Strategy, CRISIL, Mr. Debaprata Mahapatra – Head HR Elec. & Auto IC, L&T, Ms. Sangeeta Malkhede – Assoc. VP HR, CSS Corp, Mrs. Sangeeta Singh – Partner, Sanguine Consultants and Mr. Vinod Behari – Exec. Dir. HR, RECL. The key things highlighted in the discussions were usage of social media in employee engagement & networking, technology, communication, feedback and references. Traits of a leader, differentiation between a leader and a follower, main hindrances in current leadership development and initiatives and strategies in different industries taken for leadership development, were also focused in the discussions. Organizations strive towards adopting best HR practices and to align HR strategies with the organizational strategies to succeed in the long run. Hence, the emerging practices like pyramid organizational structures and change management were also brought in the discussions by the panelists. The interactions were enhanced by the questions put up by the students and faculties in the audience during the panel discussions. 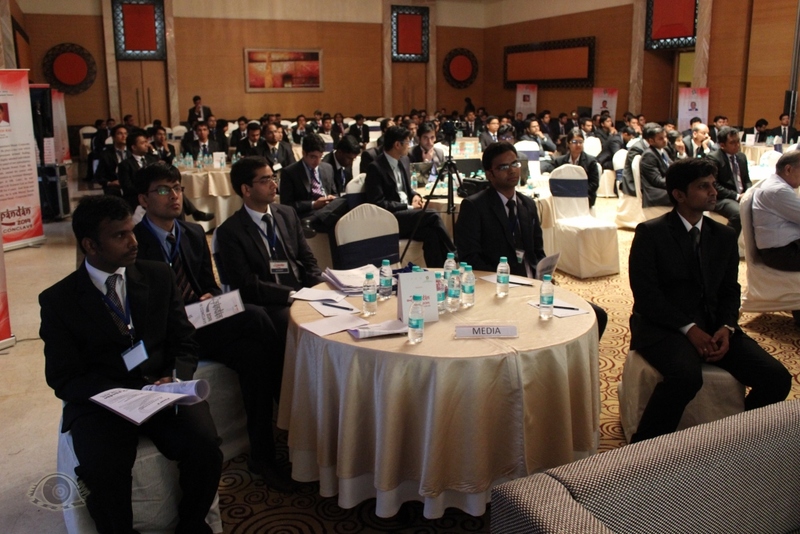 The event was very well received by the IIMU community. 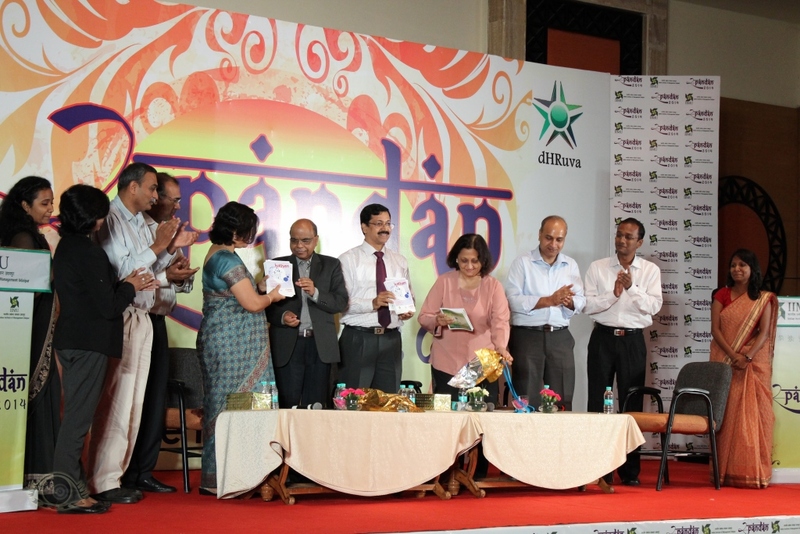 Kathan 2014, the second edition of the annual HR Magazine of dHRuva – The HR Club of IIM Udaipur was also released marking the success of the event. IRIS – The Photography Club of IIM Udaipur helped in covering the event by capturing pictures and videos. The event concluded with the felicitation of the eminent speakers of the event and a vote of thanks. IIM Udaipur aims to set new benchmarks in the field of management education and research and events like this come under the channel of initiatives aiming to create a platform for discussing subjects and issues that are most relevant to the current times and future trends. MarClan – The Marketing Club of IIM Udaipur organized the first Guest Speaker Session for this year of its continuing series, ColloquiuM!. The talk in this session was delivered by Mr. Romi Mahajan. Mr. Mahajan is a world renowned Marketing and Creative Thought Leader. His credentials include working as a Director of Sales and Strategy for Digital Marketing Platform Group at Microsoft and Founder-President of KKM Group et al. He was accompanied by Mr. Kshitij Jain of Advaiya Solutions Pvt. Ltd..
Mr. Mahajan spoke extensively on the topic “The Marketing Panorama – Reclaiming Marketing from ROI Zealtory“. Coined to what he called as “The ROMI TRAP”, he elaborated on how companies’ drive towards measuring and quantifying the return on marketing investment and advent of new mediums and platforms like digital and social media have been cannibalising the culture of Marketing. 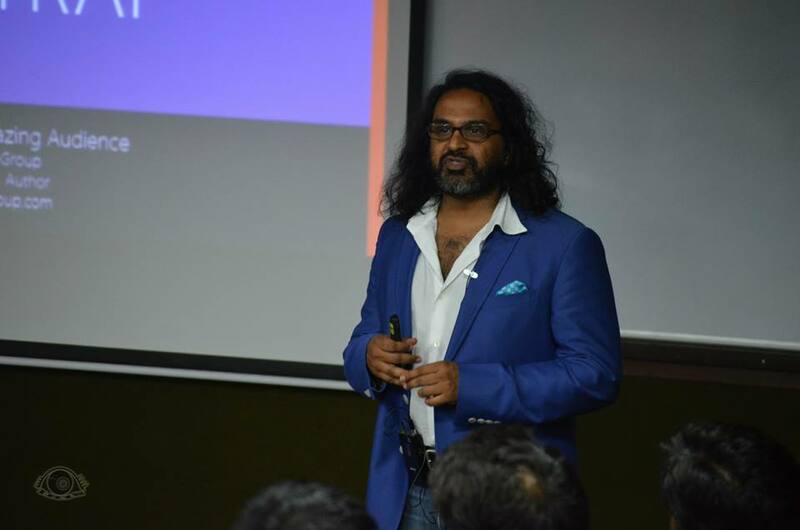 According to him the intuition and creativity which led to many successful and innovative marketing strategies/campaigns formulation have been compromised by the use of pseudo-science in modifying the techniques of Marketing. The session was an interactive one and the students in attendance put in some really interesting aspects to the discussion throwing concepts backed up with examples from real world. The effects of advertisements in marketing communications as they were showcased in the traditional media in the television, their nostalgia factor and the social/digital media wave using that to encash the same effects simply took the discussions to stratum. 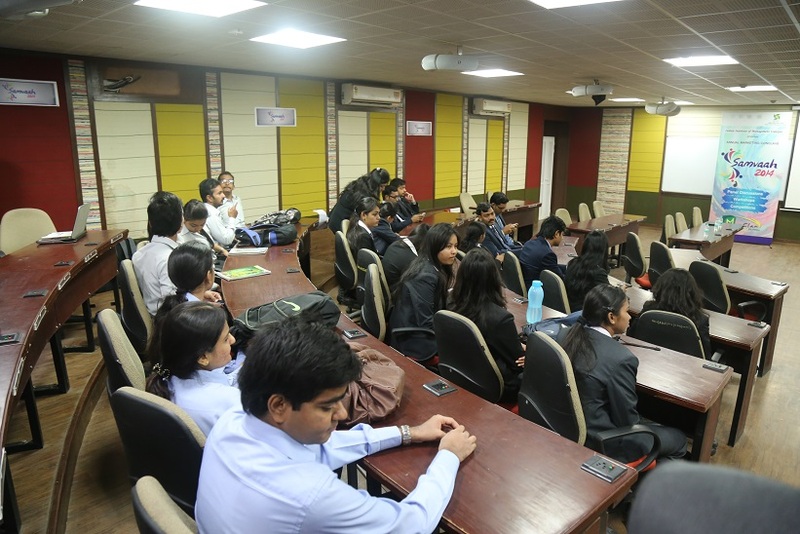 The various Clubs and Committees at IIMU keep on organizing such sessions round the year to aid students in picking up the nuances of management from the industry that the speakers represent in addition to the subjects’ knowledge gained in the academic curriculum pedagogy. 1. Commitment to Sustainability: Did you know that the infrastructure and activities at IIMU boast of total commitment to a green campus? Exemplified by the Director – Prof. Janat Shah himself, who was the first person to use a bicycle in the campus when it was founded. Today, more than 60% people on the campus including the students, faculty and staff follow that lead. 2. Commitment to Diversity: Did you know that if you want to have a debate in IIMU hostels in your favourite language then you will find a person at least 10 rooms away? The cultural diversity at the campus will amazingly enhance your people skills. And yes, you can always end up in a debate in more than 5 different languages. 3. Commitment to Rural Exposure: Did you know that 100% of the batch gets exposure to Rural India by the carefully designed Rural Immersion Programme? This will help you to be more sensitized and develop as socially conscious managers who can work in future towards collective and inclusive growth of the society. 4. Commitment to Global Exposure: Did you know that 60% of the students in the batch get their visas stamped at least once during their stay at IIM Udaipur? This reflects IIMU’s commitment to make global managers of tomorrow ready to work in diverse conditions and situations, leading global teams and implementing their learnings in the real business world. 5. Commitment to Best Faculty: Did you know that in addition to 22 permanent faculties, prominent faculties from the top B-Schools of India like IIMA, IIMB, IIMC etc. visit to bolster the academic wealth of IIMU? This ensures personalized attention to the students resulting in their better learning, grooming and hence forth, transformation. 6. Commitment to Transformation: Did you know that with specially designed programmes which aim to inculcate values like integrity, honesty, respect, ownership, trust and excellence, you will transform into a better person and manager at the end of two years? With collaborative and focused programmes with agencies like Hay Group, you will develop emotional intelligence and see yourselves developing into leaders more confident of your capabilities and decision making judgment. 7. Commitment to Awareness of Cultural Roots: Did you know that at IIMU you will be celebrating festivals and participating in cultural activities you did not even know about? 8. Commitment to Team Work: Did you know that at IIMU you will be doing so many assignments, live projects and club activities in groups that you will emerge as a leader in team working skills? 9. Commitment to Entrepreneurship: Did you know that IIMU takes a plethora of initiatives to foster the spirit of entrepreneurship? You will get a lot of opportunities under the ambit of entrepreneurship which will help you to pursue your career goal of starting your own business. 10. Commitment to Sleepless Nights: Did you know that apart from the load of assignments and projects of a usual B-School, a lot of other things at IIMU like TT matches, clubs/committees activities and B-School competitions will keep you awake till wee hours every day and you will be going to enjoy it? Things which differentiate IIM Udaipur – Team Work! Climbing the ladders of a managerial career requires one to be cinch with team working abilities. Beginning from management trainees and proceeding through various phases of middle management and senior management roles, responsible managers are expected to work and deliver according to best of the capabilities of the team with which they are associated. IIMU follows the pedagogy in the academic and non-academic student affairs in such a manner that the best of team working skills are inculcated in the students within the first three months itself of their stay at the institute. The academic programmes of the institute are launched with the first week entirely dedicated to team building workshops. External agencies who are specialist in the field are also sought to conduct innovative exercises involving sports, games et al to help in ice-breaking between the students and help them get ready for their journey in the institute. A large part of the academic process involves weightage given to assignments, project submissions and class presentations given in study groups, furthermore, individual assignments. The study groups are formed by the Programmes Office with inputs from the faculty. A large care is taken to ensure parameters like academic, cultural and work experience diversity in the formation of groups to enhance the overall functioning of groups. IIM Udaipur has adopted case based learning methodology and a significant importance lies in the class participation and case discussions, hence providing the students of a feel of simulation of real life complex managerial situations. The student clubs and committees and their plethora of vibrant activities in the institute complement the team building process. These bodies maintain autonomy in their selection process and hence bypass a large number of conventional parameters to form best teams aligned with their outcomes. The challenges posed to the students prepare them in honing their skills not confined to academic pursuits. The institute provides ample opportunities, independence and resources to students to conceive ideas and work in teams to plan and orchestrate their design and implementation. The institute has seen many such student driven initiatives culminating into events like The Leadership Summit – The Flagship Event of IIMU, Arth Samvaad – The Annual Finance Symposium of IIMU, Spandan – The Annual HR Conclave of IIMU, The Udaipur Leap Day Literature Festival and the Excursus Series. Other prominent didactics like Live Projects, Field Surveys, Focus Group Studies, Industrial & Companies Visits, Global Immersion Programme, Student Exchange Term, Rural Immersion Course, Summer Internships and Placements Preparation Process all benefit students in the team working abilities by teaching them the values of mutual respect, appreciation, motivation, trust, understanding and refining of opinions, processes and working approaches. Students also unite together with common interests and have come up with hobby clubs and societies for activities pertaining to sports, dance, music, arts, literature, photography, dramatics etc. Dedication to serve for a sensitive cause and social responsibility have also resulted in execution of student drives like Blood Donation Camp, Stem Cell Donation Camp and School Children Mentorship Programme. Leaders well known in the corporate world are comprehended as great based on their abilities to lead teams with perfection for exceptional work deliveries. And IIMU strives to help students in developing as managers more confident of their team working capabilities and more responsible for team based actions so that they excel in their corporate journeys after learning the insights of transition at their stay at IIM Udaipur.